The TIE fighter is arguably the most recognizeable space ship in movie history. It was designed by Colin Cantwell at ILM for for the first of the Star Wars movies. The Twin Ion Engines, the hexagonal wings with solar panels, and the orb-shaped cockpit in the middle makes it stand out from all other ships. And like most cool things before CGI and 3D printers, they were crafted in glorious detail, by hand. Not to say that modern technology isn’t good. 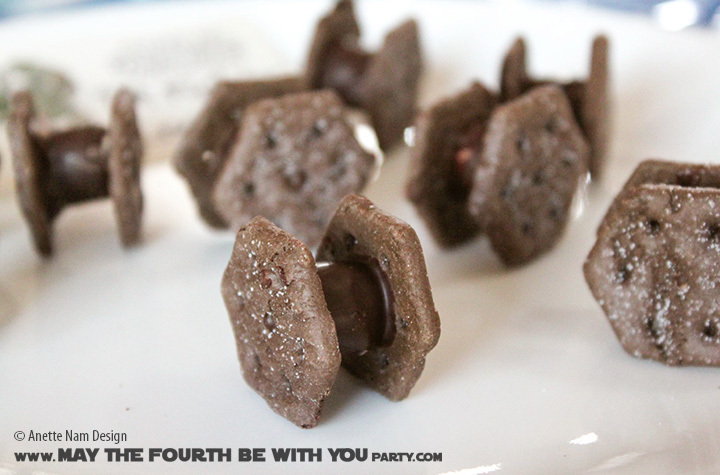 If I had a 3D printer that could print chocolate, the Imperial S’mores would be WAY faster to make. BTW, this is THE favorite food we make for the M4Ps. (AND a M4P original!) We make a whole armada! Melt chocolate in a microwaveable bowl. Dip marshmallow, swoosh around and cover in melted chocolate. “Glue” crisp on each flat side of marshmallow – hold for a few seconds to let chocolate cool and set a bit. When you serve, these will go really fast, you might want to put out only one squadron at a time.